"Let My Movers be Your Movers!" My Movers Moving and Storage was established by the Pearson Family in 2007. They chose to open their business in Springfield, Missouri and based My Movers’ service on family oriented values shared throughout the beautiful Ozarks. Brad and Trish bring over 60 years experience in the moving industry to My Movers Moving and Storage. Each move benefits from that experience making a “smooth move” your reality. 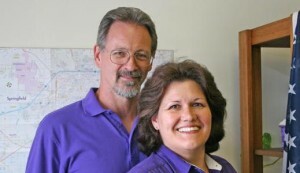 Brad and Trish bring over 60 years experience in the moving industry to My Movers Moving and Storage. Each move benefits from that experience making your unique move a smooth reality.